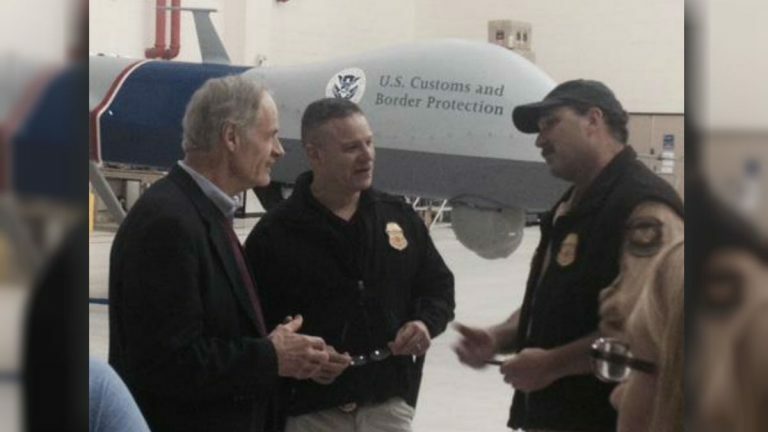 Senator Tom Carper, D-Delaware, met with local ranchers and border officials during a weekend visit to Texas. From unmanned drones to traditional outlook towers, Delaware’s senior Senator got a firsthand look at the latest measure in place to secure the border between Texas and Mexico. “I’m not convinced that we need a lot more boots on the ground, what we do need is what I describe as force multipliers,” said Carper. Carper also used the trip to draw attention to the need for Congress to pass a full year funding bill for the Department of Homeland Security. As the top ranking Democrat on the Senate Committee on Homeland Security and Governmental Affairs, he warned that if a clean funding measure isn’t approved, more than 40,000 Customs and Border Protection officers and more than 13,000 immigration agents could be asked to keep working without pay. Carper said funding DHS through a continuing resolution means Immigration and Customs Enforcement would not be able to pay for enough adult or family detention beds when responding to immigrants illegally crossing the border. It could also prevent upgrades of surveillance technology along the border.